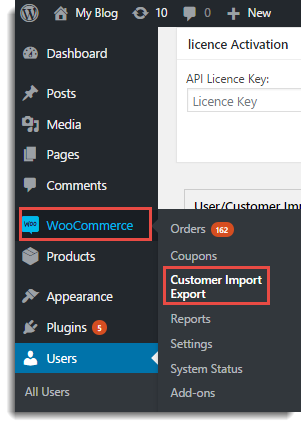 This tutorial explains how to set up WordPress Users & WooCommerce Customers Import Export Plugin. Please refer to the product page to know more about the plugin features. WordPress Users & WooCommerce Customers Import Export Plugin is an ideal plugin for exporting and importing user/customers details from/to your WooCommerce store for migrating an existing online store. You can import users/customers from WooCommerce store as well as another e-commerce platform. It exports users/customers from WooCommerce store to the CSV file. You can import/export/merge(update existing users/customers) hundreds, even thousands, of users/customers details using one file which saves your effort and time of manually adding user’s information. 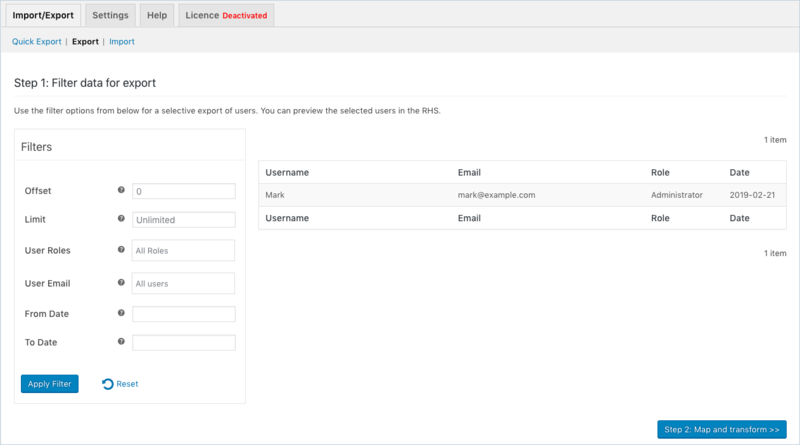 The plugin has the option to send an Email to the user email ID whenever admin imports/updates users details. 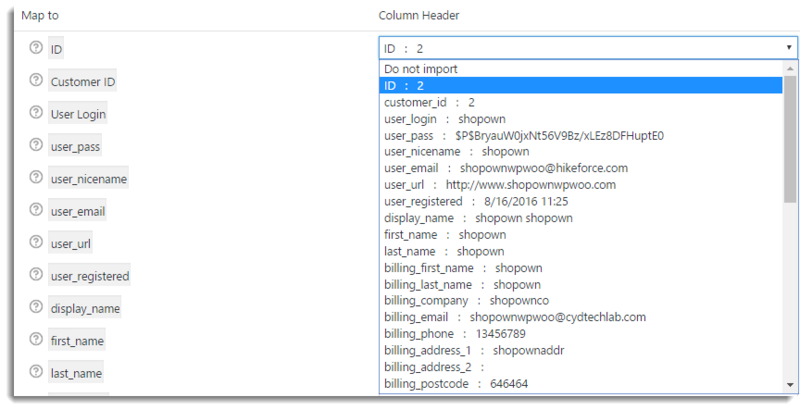 You can map your import columns to the appropriate WooCommerce data to import or merge users/customers details. You can also import data from a variety of sources, such as an uploaded CSV file on FTP, locally saved CSV file to your computer. For importing users/customers details to your online store, you must create a CSV(Comma-Separated Values) file which contains information about mapping fields in a tabular form. You can create a CSV file by using a spreadsheet program, such as Excel, or Google Spreadsheets. Save this file with the extension ‘.csv’. After entering all details about users/customers in the spreadsheet, you can import to your online store. Plugin easily exports users/customers details to CSV file with multiple powerful filters such as User Roles, date ranges, etc. Even the plugin automatically upload your exports via FTP. After purchasing the WordPress Users & WooCommerce Customers Import Export Plugin, plugin Zip file is available in MY ACCOUNT. Note: If you have the basic/free version already installed, please Deactivate and Delete the Basic Version before installing Premium Version to avoid any conflict. Your plugin settings will be retained intact. For detailed information about installing Plugins, See How to Download, Install, Activate & Update WooCommerce Plugin? Navigate to Dashboard > Users > User Import Export. The plugin takes CSV file as input. It maps each field of CSV file to the field of a particular Users/Customers. For example, customer_id field gets mapped to the identification number of the customer and the user_login field gets mapped to the user login name. If you want the plugin to work correctly, you must map headers of all of the column correctly and you must ensure that all of the fields you enter must be in the correct format. Note: If there is any mistake in your import file, your Users/Customers import may not work as expected. Also, the CSV Import file must be in UTF-8 format. For more information about UTF-8 encoding, read How to save CSV / Excel File as UTF-8 Encoded? To get started you must have CSV file. 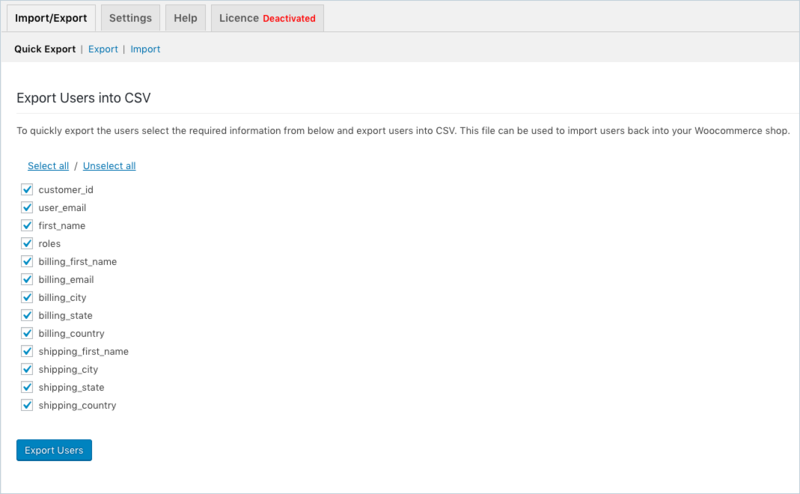 You can create the one by exporting the Users/Customers to get the format of CSV, download Sample User CSV. 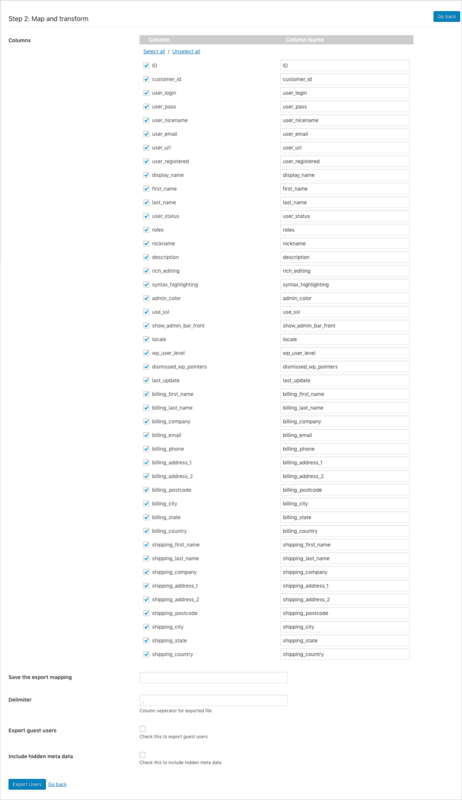 Each row contains a single user. Basically, there are two methods for importing. You can choose any one method from the two for importing users/customer details. Send Email to New Users: Select the checkbox to send an Email to a new user on importing details. Click on Upload file and Import to proceed further to Step 2. Select a required option from the drop-down list. Here, a user ID is mapped to ID. For Example: Suppose, you want to assign test@test.com as the user email. Under Evaluation field, write =test@test.com in user_email row. To Convert the registered date to WooCommerce format, provide your CSV date format in the evaluation field. For Example: In CSV, If you have entered the date incorrect PHP format as @ d/m/yy H:i:s ( @ 13/07/2016 4:24:25) , then under Evaluation field, you must maintain the same date format as @ d/m/yy H:i:s in the user_registered row. Then the plugin internally converts it in WooCommerce format as 2016-07-13 4:24:25. 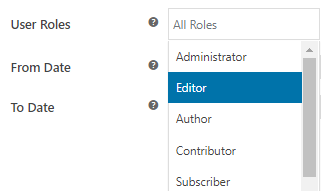 For Example: Suppose, you want to append role by By HikeForce. Under Evaluation field, write &By HikeForce in role row. For Example: Suppose, you want to prepend Billing First Name by Mr/ Mrs. Under Evaluation field, write &Mr/Mrs[VAL] in billing first name row. Note: Hover the mouse on? (Help), you can see the information about Evaluation field. Enter the filename in the field provided to save the mapped field to reuse it later. The users/customers will be imported from the CSV into your online store. The window appears as shown below indicating successful import. Choose file: Browse the updated CSV file by clicking on Choose file or by FTP settings. Delimiter: Enter the delimiter which separates the values. Send Email to New Users: Select the checkbox to send an Email to a user on updating details. The updated details of the users/customers will be imported from the CSV into your online store. The window appears as shown below indicating successful import. Note: If user ID does not exist, then the user is imported as a new user. If you export users using the plugin, you get the CSV file which contains the data about all the users of the WooCommerce online store. Offset: Enter the user row number at which you wish to start the export. Limit: Enter the maximum number of users that you wish to export. From Date: Select the date of registration from which you want to export the users by clicking on the calendar icon. To Date: Select the date of registration till which you want to export the users by clicking on the calendar icon. After you have entered the required filter click on the Apply Filter button. You will be able to see a preview of the selected users on the right-hand side of the page. Clicking on the reset button will clear all the filters that you have applied. After the required filters have been applied, you can proceed to the second step by clicking on Step 2: Map and Transform button. This will take you to the following screen. Select a mapping file for export: Similar to import settings, you can select an existing mapping file for export. This option is enabled only when you create your first mapping file on any of the prior user exports. Save the export mapping: Enter a mapping filename for exporting. Export Guest Users: Check this option if you want to export the guest users of your website to be exported to the CSV file. Include hidden metadata: Check this option to include hidden metadata from the third-party plugins. Click Export Users, the CSV file gets auto-downloaded to your computer. The sample users CSV file is as shown below: Note: You can download the Sample Exported CSV. 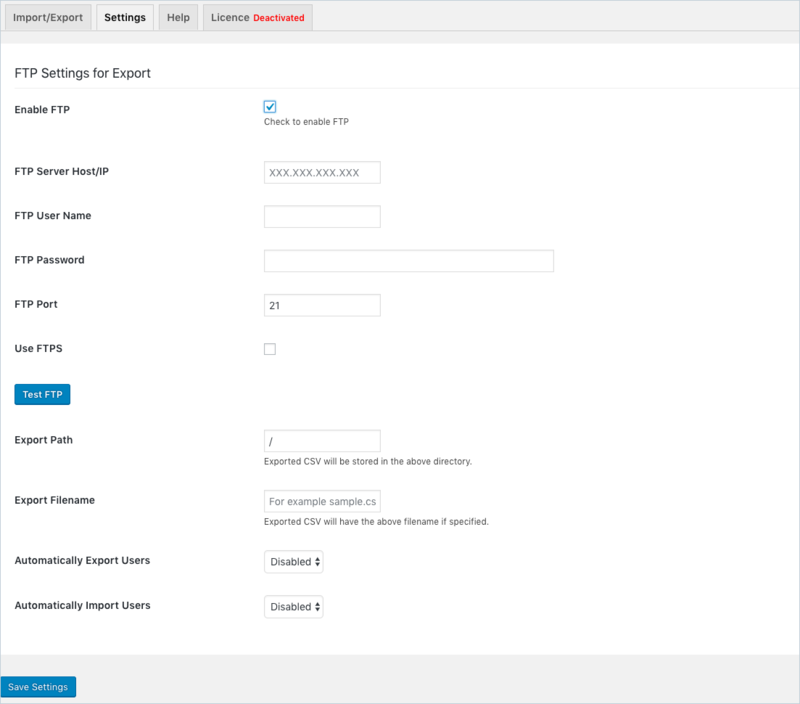 To quickly export the required details of users, navigate to Customer Import Export > Import/Export > Quick Export. Select the required field from the listing and then click on Export Users, the user details will be auto-downloaded into your system. This file can be further used to import users back into your Woocommerce shop. To export Users, select them. From Bulk Action drop-down list, select Download as CSV and click Apply. All the information about selected User(s) gets auto-downloaded to CSV file. Under the Settings tab, you can set the FTP settings to export users. Also, you can auto-export / import the users periodically. On clicking the Enable FTP option, you will get the settings options for the automatic import and export of the users via FTP. Select the checkbox to enable FTP import/export Users. Enter the FTP Port number. Enter the Export Path where the exported file should be saved. if specified, the exported file will have the name entered in the Export Filename field. 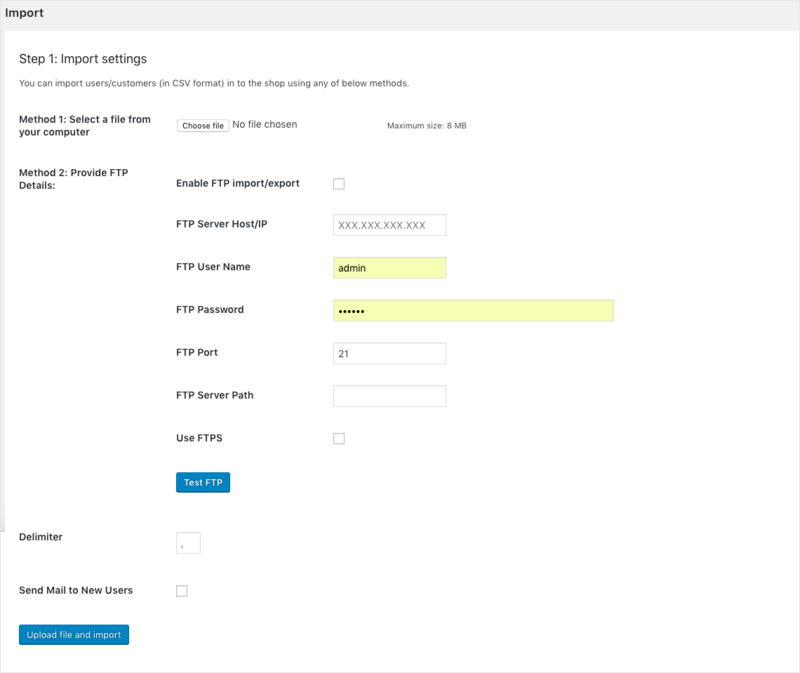 Choose Enabled option to Automatically Export Users from FTP Server Host/IP. Enter the required Export Start time for exporting the Users. Enter the time interval in minutes for exporting users in the Export Interval [ Minutes ] field. 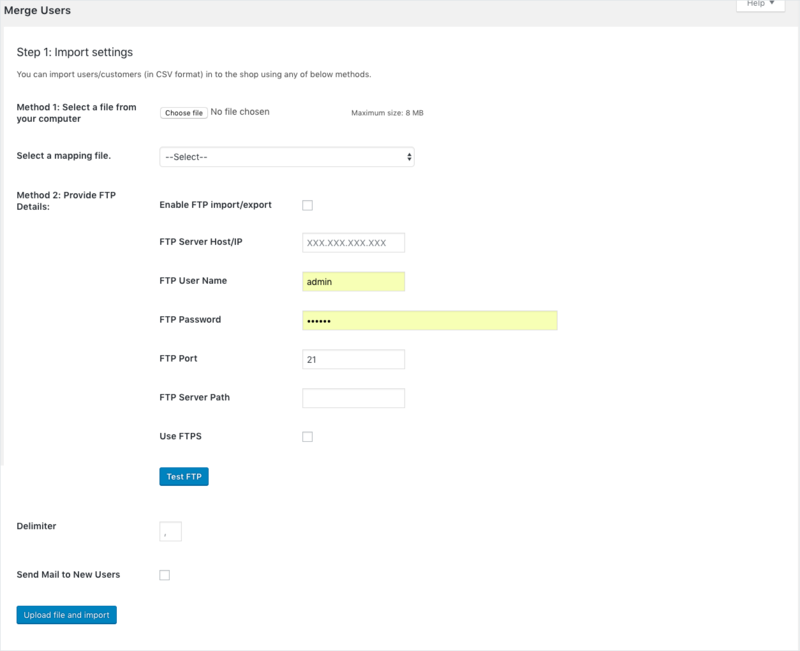 Choose Enabled option to Automatically Import Users from FTP Server Host/IP. Enter the required Import Start time for importing the Users. Enter the time interval in minutes for importing users in the Import Interval [ Minutes ] field. Select Update User if exist checkbox to merge existing Users with the updated details. The Merging is possible only if the ID of User already exists in your online store. Otherwise, the user is imported as a new one. Select a required mapping file from the Select a mapping file drop-down list. The field will be available only if there is a mapping file saved in any prior exports. Click Save Settings to save the FTP settings. For more information about corn job, please refer Setting Up The Cron Job. Check out our WordPress Users & WooCommerce Customers Import Export Plugin. This entry was posted in Documentation, Getting Started, WooCommerce, WordPress Users & WooCommerce Customers Import Export. Bookmark the permalink. Print Invoice, Packing Slip, Delivery Note & Label – Change Label in the document.